It’s summertime! It’s hot enough outside, so turn off your oven, and turn on the creativity. Gone are the days when eating vegan meant missing out. Feast your eyes on these five delectable non-bake desserts that will satisfy your sweet tooth. Warning: Chocolatey goodness to ensue. In only 15 minutes, you’ll have 15 cookie clusters that will nix your chocolate craving. In a pot, melt the agave nectar, coconut oil and cocoa powder, and bring to a boil for 2 minutes. Remove the pot from heat, and stir in the oats, peanut butter, coconut and vanilla extract. The combination of chocolate and avocado is divine. This tasty non-traditional mousse is a great way to satisfy those cravings with the added benefit of a few essential nutrients. In a saucepan, combine the chocolate chips and coconut milk over medium heat. Stir well and let cool. Chop up the avocados, smash them with a fork, and blend them together with the vanilla, agave and salt until smooth. Add the chocolate-coconut milk mixture until you achieve a creamy texture. Pour the mixture in ramekins, and place them in the fridge for an hour or two, until the mousse is firm. Dig in! Note: If your avocados aren’t the desired ripeness, bunch up the chopped pieces of avocado in aluminum foil, and pop them in the oven at 375 degrees F until soft. A refreshing summer treat couldn’t be simpler! This makes for a quick indulgence for yourself or any number of guests. 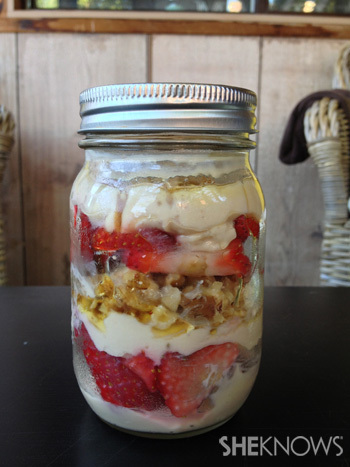 Create individual servings in Mason jars so your guests can delight in seeing and savouring the freshness. In a glass or bowl, pour some yogourt. Slice the strawberries, and place a layer on top of the yogourt. 2. Add another layer of almond yogourt. Crush some walnuts, and sprinkle over the yogourt. Repeat as many layers as you wish, and drizzle agave nectar to your heart’s content. Biting into one of these heavenly rolls is utter bliss. Adjust the amount of each ingredient at your discretion (and desire!). It’s fast and foolproof. Chop up the dates and walnuts into tiny pieces. Slather the dates in coconut oil, and add in the rest of the ingredients. 2. Roll the mixture into balls, and spread them out on a baking sheet. 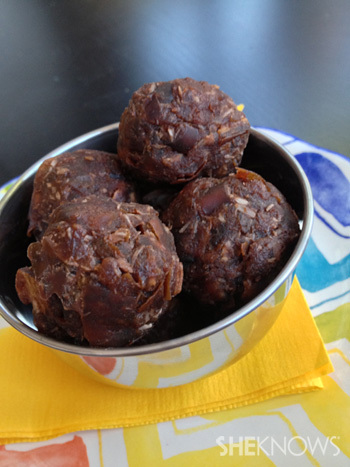 Place them in the refrigerator for half an hour or so before enjoying this tasty treat. You’ll need heat for this Mediterranean treat, but as promised, the oven remains untouched. Bring the ingredients to a boil for 10 minutes or until desired thickness is achieved. Allow the syrup to cool. Boil the potato in the 3-1/2 cups of water. Once softened, crush the potato in the remaining water. Add the yeast and sugar to the 1/2 cup of warm water, and allow it to rise (approximately 5 minutes). Add this to the potato mixture. Mix in the flour. Cover the dough with plastic wrap, and set it aside for half an hour. In a deep pan, bring 3 inches of vegetable oil to a boil. Drop the mixture a tablespoon at a time into the oil. Allow the dough to bubble and float, and continue to rotate each piece until lightly browned. Place the pieces onto a paper towel to absorb some of the oil. 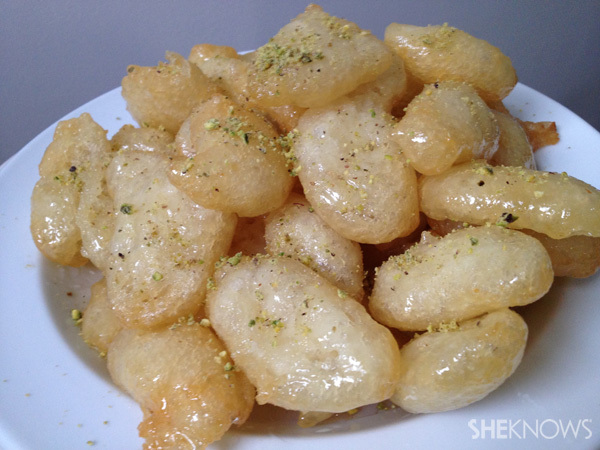 On a plate, thoroughly coat the pieces in the syrup, and top the loukoumades with cinnamon or crushed pistachios (or both! ).